Here we take you far into the desert where you will be hiking and sleeping out in the open, away from any fixed camps. This programme takes you south from Wadi Rum Village, a long way from the tourist paths, and as far as the Saudi Arabian frontier. It is quite a serious trek, you will be walking around 7 to 8 hours every day, mainly on the desert tracks, but sometimes on the mountains. We shall be sleeping in a different place in the desert each night, and shall ask you to bring sleeping bags; we shall supply tents and mattresses. You will need a rucksack or shoulder bag for your sweater, water, a camera, and for the other necessities one takes on a trek, and of course, good hiking shoes or trekking sandals. Boots are not necessary, but you should have cotton socks with you. We will have a jeep to bring along your luggage, the bedding, food and water, and the cook/driver will meet us for lunch and at the camp in the evening. We supply mineral water as well as tea and instant coffee. A half hour jeep transfer south to the Khasch mountain and a hike along the Ridge. This is a long ridge stretching from east to west across the desert. There is no particular difficulty about this walk, although perhaps you might need to use hands to go up and to come down again at the end. We shall take a picnic lunch with us and stop somewhere to eat. Be sure to cover up against the sun here, there is little shade around, but the views to the north over Wadi Rum and to the south towards Saudi Arabia are magnificent. In the afternoon, hike down through Wadi Noghra to Wadi Saabit. 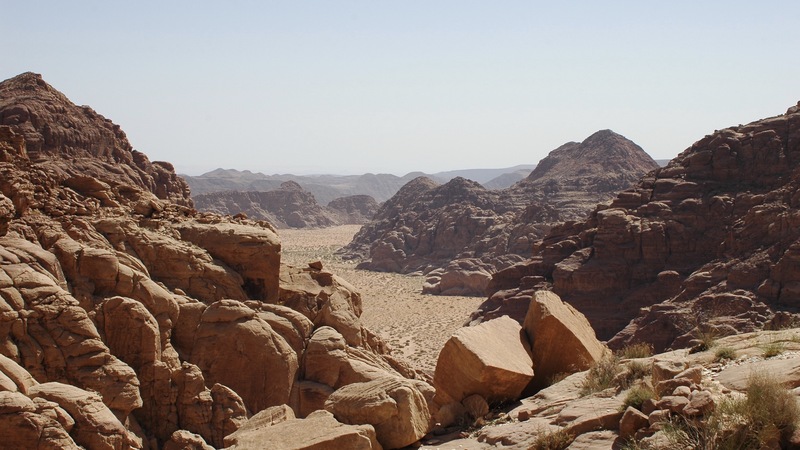 Noghra is a narrow valley leading to one of the great east-west valleys of Wadi Rum. We are a long way from the beaten track here and are unlikely to see any other tourists. There will probably be a number of camels around, perhaps with babies, especially in the springtime. We will sleep close to a hidden valley which is (well) protected by a lot of soft sand. It is not easy at all to bring a vehicle anywhere close. This valley, known as the Siq um Barid, (“the cold canyon”) is hidden in a cleft of the mountain, close to Wadi Noghra and on the northern edge of Wadi Saabit. Even when you are only a few meters away, you don’t realize that it is there. It is perhaps 50 meters long, delightfully cool and green, and the many inscriptions there show that ancient people knew and used it. There is a place where water collects when it runs off the mountains, and the many drawings of ibex show how the people lived by hunting. We shall have time to visit this valley, either in the evening or the next morning. A jeep transfer to Jebel Um Adaami, right on the border with Saudi Arabia. We shall climb this mountain, it is a mountain walk over rough ground with no particular difficulties. The views are magnificent, once more. In the afternoon we continue walking back along Wadi Saabit on the southern side this time, to another tiny valley, of which the walls are completely covered with inscriptions. They are quite incredible, no drawings, this time, just writing in an unknown alphabet. We will sleep near this valley. We will continue hiking to the west towards the area around Jebel Sweibit and the imposing Hajj mountain. We will sleep near this mountain. We are still in the heart of the red sandstone area of Wadi Rum, the scenery is spectacular and the many small massifs dot the landscape. This is one of the great climbing areas of Wadi Rum, where some of the most experienced climbers come regularly. More hiking, but now we are heading home to the north. We pass the very impressive landmark of Jebel Qatar and its dripping well, before finishing at Wadi Rum village in the afternoon. – Bedouin guide Speak English. – Bedouin tea and water. *Children under the age of 3 are free of charge. Children under the age of 7 get a 50% discount. Children under the age of 13 get a 25% discount. Prices for 5 or more people are available on request.